Presidential yachts have become something of a rarity in the 21st century, but in their heyday these magnificent vessels were the ultimate sign of power for heads of state across the world. Launched by J&G Thompson in 1896, USS Mayflower was one of the earliest presidential yachts, hosting five commanders in chief from Theodore Roosevelt to Calvin Coolidge over a 24-year period before Herbert Hoover had her decommissioned in 1929. Measuring 83 metres LOA, she was used for a 1905 peace conference that helped to bring about the end of the Russo-Japanese War. After serving in the US Coast Guard and the Israeli Navy, USS Mayflower was broken up in 1955. Presidential yachts have become something of a rarity in the 21st century, but in their heyday these magnificent vessels were the ultimate sign of power for heads of state across the world. Launched by J&G Thompson in 1896, USS Mayflower was one of the earliest presidential yachts, hosting five commanders in chief from Theodore Roosevelt to Calvin Coolidge over a 24-year period before Herbert Hoover had her decommissioned in 1929. 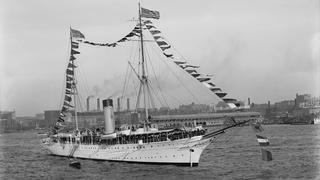 Measuring 83 metres LOA, she was used for a 1905 peace conference that helped to bring about the end of the Russo-Japanese War. After serving in the US Coast Guard and the Israeli Navy, USS Mayflower was broken up in 1955. One of the world’s largest superyachts, Savarona was launched in 1931 by German yard Blohm+Voss for American heiress Emily Roebling Cadwalader, and was sold to the Turkish government six years later to serve as the presidential yacht for Kemal Atatürk, the founder of modern Turkey. Still available for charter in Istanbul, Savarona was given a $35million refit in 1989. Key features on-board this 124 metre superyacht include a Turkish bath that spans the entire 16 metre beam. 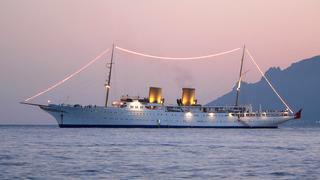 One of the world’s largest superyachts, Savarona was launched in 1931 by German yard Blohm+Voss for American heiress Emily Roebling Cadwalader, and was sold to the Turkish government six years later to serve as the presidential yacht for Kemal Atatürk, the founder of modern Turkey. Still available for charter in Istanbul, Savarona was given a $35million refit in 1989. Key features on-board this 124 metre superyacht include a Turkish bath that spans the entire 16 metre beam. Launched in Genoa in 1938 as an auxiliary cruiser for the Yugoslavian Navy, 115 metre Galeb is one of the more controversial presidential yachts on our list. Owned for many years by the first president of Yugoslavia, Josip Broz Tito, she was used as a floating residence, embassy and party boat, hosting Hollywood stars like Elizabeth Taylor and Richard Burton, as well as carrying Tito to London for a state visit in 1953 — the first by any communist leader. Since Tito’s death in 1980, Galeb (which means seagull in Croatian) has fallen into a sorry state, languishing in the port of Rijeka for the past decade. However, plans are afoot to convert Galeb into a museum ship in time for the city’s European Capital of Culture celebrations in 2020. Launched in Genoa in 1938 as an auxiliary cruiser for the Yugoslavian Navy, 115 metre Galeb is one of the more controversial presidential yachts on our list. Owned for many years by the first president of Yugoslavia, Josip Broz Tito, she was used as a floating residence, embassy and party boat, hosting Hollywood stars like Elizabeth Taylor and Richard Burton, as well as carrying Tito to London for a state visit in 1953 — the first by any communist leader. Since Tito’s death in 1980, Galeb (which means seagull in Croatian) has fallen into a sorry state, languishing in the port of Rijeka for the past decade. 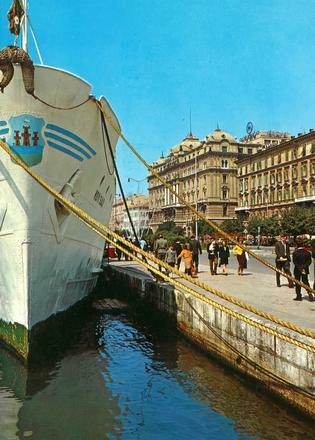 However, plans are afoot to convert Galeb into a museum ship in time for the city’s European Capital of Culture celebrations in 2020. One of two US Presidential yachts that still survives to this day, USS Potomac was used by Franklin D. Roosevelt as his floating base from 1936-1945. Famous guests who FDR hosted aboard this 50 metre former US Coast Guard vessel included royals at sea King George VI of the United Kingdom and Crown Princess Märtha of Norway. At the end of World War II, USS Williamsburg took over from USS Potomac as the presidential yacht. Harry Truman was particularly fond — he took her to Key West for a vacation in 1951, and used her as a base for talks with British prime minister Winston Churchill and Mexican president Miguel Alemán. Truman’s successor, Dwight Eisenhower was less enamoured and had her decommissioned after just one cruise aboard. 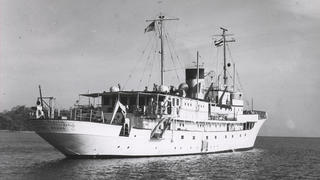 The 74 metre presidential yacht was later converted into an oceanographic research vessel by the National Science Foundation. Currently lying in La Spezia, her hull is offered for sale as a restoration project. 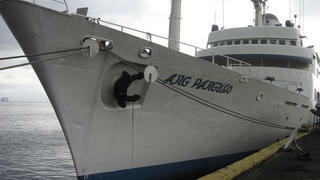 Gifted to the Philippines as part of Japan’s post-war reparations, BRP Ang Pangulo was converted into a presidential yacht in the late 1950s. Famous faces believed to have spent time on board include dancers Margot Fonteyn and Rudolf Nureyev, and actress Brooke Shields. This 77 metre yacht is still in service today, but the recently elected president of the Philippines Rodrigo Duterte plans to have Ang Pangulo decommissioned. 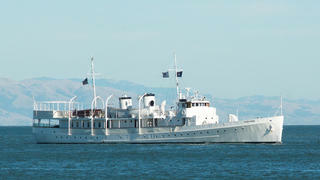 At just 32 metres LOA, USS Sequoia is the smallest presidential yacht on our list, but her history is no less storied. 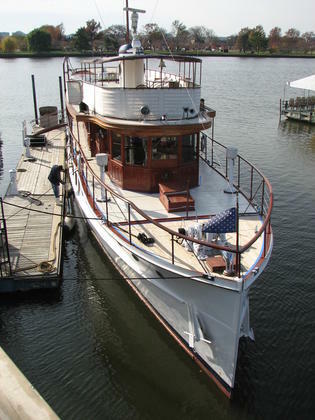 Designed by John Trumpy and launched in 1926 at the Mathis Yacht Building Company in Camden, New Jersey, she was used to intercept moonshine smugglers in the prohibition era. She has hosted a series of US presidents, including John F. Kennedy, who celebrated his last birthday on board, and Richard Nixon, who took a cruise with more than a dozen baseball stars after the 1969 All Star Game. Despite being decommissioned in 1977, USS Sequoia is still afloat today. A protracted legal battle rages on over the cost of her restoration, which is claimed to be in the region $4million. At just 32 metres LOA, USS Sequoia is the smallest presidential yacht on our list, but her history is no less storied. Designed by John Trumpy and launched in 1926 at the Mathis Yacht Building Company in Camden, New Jersey, she was used to intercept moonshine smugglers in the prohibition era. She has hosted a series of US presidents, including John F. Kennedy, who celebrated his last birthday on board, and Richard Nixon, who took a cruise with more than a dozen baseball stars after the 1969 All Star Game. Despite being decommissioned in 1977, USS Sequoia is still afloat today. A protracted legal battle rages on over the cost of her restoration, which is claimed to be in the region $4million.